Let’s take that list of what to expect of the living generations in the current social era – the Crisis Era in Strauss & Howe terms – and look at the expectations for my generation, Generation X. My generation is in mid-life now, between the ages of 36 and 57, in the phase of life where we will reach the peak of our career achievement and financial earnings. Having already sorted ourselves into winners and losers in the Unraveling Era, and then weathered the Global Financial Crisis and Great Recession, for many us this peak won’t amount to much. Many of us will be lucky if we can retire with even a modicum of comfort. A tiny minority of us have become the wildly successful and wealthy techno-utopians who have reformatted the economy. The billionaires at the very top of the heap even have their own space programs. But most of us are just muddling along, without a grand plan, as we have all of our lives. Despite economic recovery, we are anxious about what disruptions will come in the remaining few decades that we will be able to earn a living. We haven’t all been materially ruined – yet – but the Crisis Era is not over, and our President has decided to start a Trade War (insert eye roll emoji here). It is plain that Generation X is ambivalent about the emerging new order. On social media we confront the current political crisis with posts that range in tenor from mocking to incredulous to anguished. It is unclear where we are headed, so ambivalence is perhaps inevitable. What is clear is that the old Culture Wars of the previous era have come to a head – and while some of us have picked our faction, many of us remain on the sidelines. Gen X may be overshadowed by older generations, which have retained power at the highest echelons of government. For the most part we are ignored in the media, obsessed as it is with the generation that came after us. But we’ve quietly taken over managerial leadership positions in both the private and public sectors, where we can make a difference behind the scenes. Our generation’s archetype is known for its pragmatism and resolve in solving the issues of the Crisis Era, and with the unfolding future comes our chance to live up to the expectation. I’m going to return to looking at the list of patterns to expect for the living generations in the current social era, the Crisis Era in Strauss & Howe terms, picking up where I left off a few months back. Let’s look at the remaining items on the list of predictions about the Millennial generation – that Millennials will heroically rise to political challenge, that they will develop a sense of generational community, and that they will benefit from a new focus on the young-adult world. For evidence, I will simply consider the kinds of news stories that have been prevalent on social media and the web in the past decade. So let’s start with the last item on the list. In the Millennial generation’s childhood era, which began way back in the 1980s, children benefited from a new focus on child-rearing. A wave of social change in the direction of increased child protection came in the form of mandatory safety rules, zero tolerance policies, and laws named after child victims (for example, Megan’s Law). I wrote about this on my old blog nearly twenty years ago. Now that we are in the Millennial young adulthood era, the impetus for social change has shifted to the adult sphere of life. Political change may be stymied by partisanship, but a wave of social movements has risen in response to long-standing problems. These problems were tolerated when they affected previous generations – but no more. A prominent example which can be thought of as zero tolerance policies reaching the workplace is the Me Too movement and its effects. This took off last year as a viral social media hashtag when a prominent Hollywood producer was accused by multiple women of sexual harassment. Since then, a flood of accusations has led to the downfall of many men in high places. Sexual harassment in the workplace has long been covered up by HR departments and endured by female employees, but in the Millennial era this may not be possible, or desirable, any more. A less politically charged example is the new concern over reducing concussions to football players in the National Football League. The research into the problem began in the Gen-X era, but it was only ten years ago that the U.S. Congress compelled the NFL to act. An enormous settlement was agreed upon, which has benefited retired Gen-X players, but only after they sustained the injuries in the first place. For Millennials, a protocol is coming into place to reduce the prevalence of injuries in the first place. Not that there isn’t a politically charged example connected to the NFL, by which I mean the Black Lives Matter movement. Football players kneeling during the national anthem are in solidarity with this movement, protesting police shootings of unarmed young black men. Though rates of violence have been declining for a generation, police killings still disproportionately affect minorities. In the past this may have been a topic for moralistic commentary in academia and the arts, but today it is the focus of a stubbornly persistent and controversial activist movement. Another famous movement that seems to have come and gone is Occupy Wall Street, which protested income inequality and the corruption in government and finance that was brought into stark relief by the financial crisis and bailouts in 2008. The protests on the street may have ended, but they continue in the online world. On today’s Internet feeds there are endless posts about the difficulties faced today by Millennials trying to get by in the current economy – the burden of student debt, the impossibility of surviving on minimum wage, the need to delay life events like home buying or marriage until financial stability is achieved. All of these difficulties were faced by previous generations, but now that Millennials face them there is a greater sense of urgency. Will these problems be addressed by drastic measure while Millennials are still young adults? Will student debt be discharged, and higher education be payed for by taxpayers, like primary and secondary education? Will the minimum wage be raised significantly? 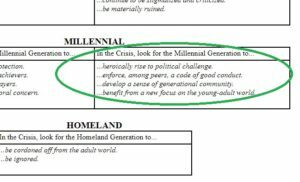 This ties into the first item on the list of what to expect from Millennials – that they will heroically rise to political challenge. There is less evidence of this. Youth voting rates have increased slightly since their nadir in the Gen-X era, but have not come anywhere close to that of the great era of civic participation of the mid-twentieth century. Older generations still have a lock on government, which partisanship has rendered contentious and barely functioning. But time favors the young generation, and they will eventually make their voices heard. All that is discussed above connects to the remaining item on the list – that Millennials will develop a sense of generational community. Just that fact the their generation’s name – originally coined by Strauss & Howe as part of an academic theory – has become a household word, and that news about them has become so prominent, shows how they are in the forefront of social awareness. Everyone is familiar, for example, with stories about how they are reshaping the economy. With the spotlight shining on them, it is hard to imagine this generation doesn’t have a strong self-awareness. If they can combine that awareness with an enforceable political consensus, they could reshape our society, and truly bring about a Millennial era. Since the streaming video era began, a new kind of content from the Millennial generation has become prevalent. It consists of episodes of commentary that dissects cultural phenomena, common sense knowledge or received history to get at hidden or unrepresented truth. A famous example is Adam Ruins Everything, which began as a series on the CollegeHumor web site and then became a television show on truTV. An example you may have seen on Facebook is Racist History. Other examples abound on YouTube, in the form of named channels such as Counter Arguments, CaptainDisillusion, Knowing Better, Loose Canon by Lindsay Ellis (though I think she might have dropped that name), and Hilarious Helmet History from the web site Cracked (which itself fits this description). With Spock-like logic and more than a little snark, the Millennial creatives who produce this content challenge assumptions and rewrite the narrative of conventional wisdom. Unsentimental and hyperrational, they seek to shine a cold, hard light on reality and reveal stark facts, repudiating the hysterics and oversaturation with meaning that characterize the Boomer outlook. 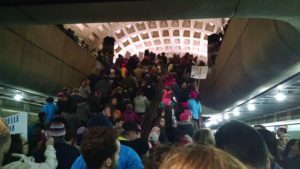 When we went to the Women’s March in Washington D.C., just after the inauguration of President Donald J. Trump, we took the metro into the city. The station and the train were crammed with protesters and their signs. I remember one woman on the train, older than us, who was holding a sign that read “THIS ABOMINATION WILL NOT STAND.” I believe she was from the Baby Boomer generation, the generation that came before mine and that shook American culture apart in the Sixties, in a wave of youth protest. And here she was, elderly and still protesting, fifty years later, which is as long as I have been alive. The abomination to which her sign referred was the election to the highest office in the nation of a man who stands for everything which she had fought against her whole life. A man who epitomizes entitled, obnoxious, and abusive white male power. A self-confessed serial sexual predator who thinks women should be grabbable at a rich man’s whim. A racist whose instinct is to treat non-whites like criminals – or worse. A lying corporate crony motivated by profits over people. And yet here he was, propelled into the Presidency by the support of millions of ordinary Americans who were duped by his demagoguery and worshipped him as their savior. It was the raging apotheosis of the backlash against the Sixties that was behind the rise of the Republican party, a backlash by people resentful of an America that was more open, diverse and tolerant. More non-white and non-Christian. The backlash had just put into power a man the same age as this protesting woman, but an ignorant and crass bully – the worst of her generation, empowered by madness. When we arrived in the city the station was so crowded that it took an hour to get to the street. A huge mass of sign-carrying people slowly made its way through the turnstiles to exit the metro, and finally we were in the open air. 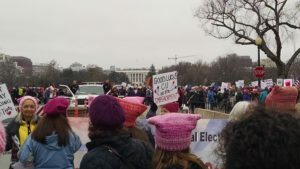 We found our way to the mall and suddenly were swept up into a throng of protesters, streaming from where the speeches had been made (speeches we had missed, since it took so long for us to reach the city) towards the White House. The chanting, roaring energy was indomitable. It was the backlash against the backlash. But would it last? As of this writing, more than nineteen months have passed. Trump has proven to be as awful a President as anyone predicted – corrupt, cruel, a threat to the republic. His supporters are entrenched in their belief in his legitimacy; they voted for him, and his faults seem invisible to them. Meanwhile, the President’s opponents have adopted the language of resistance, like freedom fighters in an occupied nation. Trump has captured the reactionary right because he is the champion of their agenda: to keep out the Hispanics and the Asians and the Muslims, to stop free trade with China, to restore America to its pre-Sixties greatness. In their minds, this agenda is a much-needed course correction after decades of American decline. And undeniably it is motivated by fear, a fear summarized by one simple headline: Fewer Births Than Deaths Among Whites in Majority of U.S. States. It is sad that fear has overtaken a large minority, and that they have rallied around an unworthy man. But he was the one who spoke their language. As I write, his fortune is crumbling, and his supporters will no doubt stand by him to the bitter end. But in the long run majoritarian opinion and demographic pressures favor the resisters. The blue wave may have hit a red wall, but it can become a blue tsunami and take that wall down. We just have to stay resolved. 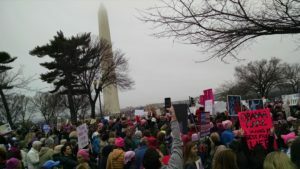 On the day after Donald J. Trump’s inauguration, we marched down the mall in the nation’s capital, until the streaming throng took us to the White House. There the crowd thinned out, as some people left, while others lingered. Some tables were set up and people held signs urging or promising the impeachment of a President who had been in office for all of one day. It was like a court being held, condemning him on his own front lawn. This was the site of the Boomer generation’s last stand, and they were as riotous, and as judgmental, and as destructive as ever. And this was where they had finally led us. Also found in this thread: mid-life Gen-Xers giving life tips to rising young Millennials. Good luck out there! We’ve been watching Star Trek: The Original Series on Netflix and I am impressed by what a good show it is, really standing the test of time. This is despite the fact that by today’s standards the plot development is slow and the acting melodramatic. On the other hand, the characters are well defined and engaging, and the stories are interesting. It’s really the superlative writing that makes the show, bringing in the talents of some of the great science fiction writers of its time. 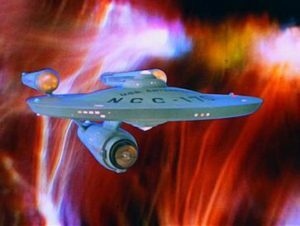 As I watch the episodes, I see how Star Trek was the fountain from which all future sci-fi television sprung. There really didn’t need to be any more sci-fi TV after that; it’s all just the same stories again and again. Not that I’m saying there shouldn’t be any more – I am someone who laments when I can’t find any more high-quality sci-fi left to watch on three different streaming services. Star Trek: The Original Series comes from another age, an expansive era when America was confident and proud. It deals unapologetically with issues of empire and civilization, has faith in the benefits of technologically progress, and projects a future where gender is still strictly defined and the white guys are comfortably in charge. Later versions of the franchise (there are at least six) tracked the changing social mood, and I’m hoping that once we’ve watched all the episodes, I can convince the family to pick up with Star Trek: The Next Generation. In my life I’ve had many jobs and moved around a lot. The Nomad life course. I have a bachelor’s degree in computer science and have mostly worked as a contractor. For fun, and because I like categorizing, I wrote down every company I’ve worked at and the year the company was founded. Some interesting patterns emerged. The majority of companies where I have worked were founded in the 2T or 3T of this saeculum. Many of these were startups that failed or got bought out. Not surprising since I am a software engineer but too old to be in on the ground floor of any 4T unicorns. These jobs were all in the first half of my career, pretty much coinciding with the 3T of this saeculum. The other places I worked in this time period were two venerable public institutions founded in the 1T of the Great Power saeculum: Virginia Tech where I went to school and the United States Geological Survey where I interned. Then in the second half of my career, starting just at the tail end of the 3T, I started getting contracts at more established companies, founded in the 3T or 4T of the Great Power saeculum (IBM for example). This reflects both my increased work experience and a life course related desire for greater work stability. This is my Nomad settling down in the 4T phase. The cell is the turning in which a company where I worked was founded. An ‘x’ marks a company where I worked in the Third Turning, and an ‘o’ marks a company where I worked in the Fourth Turning. You can see my flurry of positions at dot com startups (sadly I did not get rich from any of them) and how later in life I was working for more established organizations. And yes, that is a company founded way back in the Second Turning of the Revolutionary Saeculum, which is where I work now. I thought it was a fun exercise and you might want to try it yourself! For this summer’s trip to G-Fest in Chicago, we decided to fly instead of drive. No one had the time for an extended vacation like the one last year. We flew on Frontier airlines, which let me add to my Frontier mascot collection on Facebook. G-Fest is an annual convention held in the U.S. that celebrates kaiju, the giant monsters of Japanese film. The most famous of these monsters, of course, is Godzilla, whose storied franchise began in 1954, not long after the end of the Second World War. Through this film genre, the Japanese people have processed the utter helplessness and massive urban destruction they experienced at the hands of the United States during the war. Despite the experience of the war, there is actually an affinity between Japan and the U.S. that goes back to the years before then, perhaps best exemplified by American baseball star Babe Ruth’s visit to Japan in 1934. In the post-war years, it shows in the extent to which Americans have embraced aspects of Japanese culture, such as anime. It’s connected to the story of how Japan was the first non-Western nation to adopt Western ways and become an economic powerhouse, both in the industrial age before the war, and in the information age afterwards. 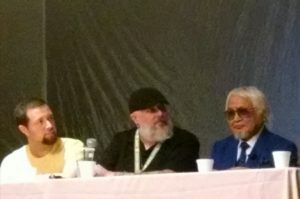 A panel includes guest Keizo Murase (right), monster suit builder whose career goes back to the beginning. He was born in 1933. G-Fest is relatively small as geeky conventions go, but it has all of the trappings one would expect from such an event – cosplay, gaming, art both amateur and professional, merchandise, discussion panels, and special guests. This year marked the convention’s 25th anniversary – G-Fest XXV – and a review was published in the Chicago Tribune, which has lots of pictures from the costume contest, evidence of the heart that people put into their fandom. 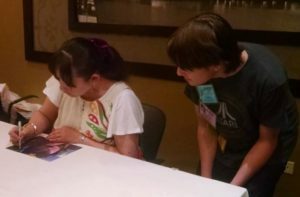 The boy gets an autograph from Megumi Odaka, who played a recurring character in six Godzilla films. She was born in 1972. The affinity between our two nations really shines at G-Fest, where you can see the love that American fans have for the veteran Japanese actors and film technicians who appear as guests of the convention. It shows in the money raised by auctioning vintage art and memorabilia in support of the victims of Japan’s recent flooding disaster. It’s almost as though Americans are doing penance for the destruction their ancestors caused. 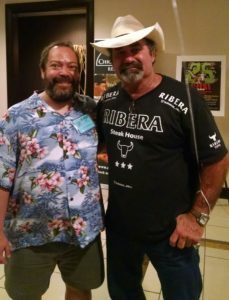 Me with Don Frye, best known for his martial arts career, but also an actor who appeared in Godzilla: Final Wars. We are about the same age. As I watch this interchange, I can’t help but think that these movies were all made during the American Century, when the U.S. was the leader of the free world, and defended Japan in exchange for Japan’s promise not to arm itself offensively. This was an arrangement made as part of the Japanese surrender in WWII, but as a new age emerges, it is being called into question. Will our relationship change in the future? There is a G-fest tradition of going to see movies specially chosen for the event at the nearby Pickwick theater. This year we saw Rampage (neither the worst nor the best monster movie ever made) and as I watched the mutated creatures smashing there way through Chicago I reflected on how the United States is still processing 9/11. We are still trying to find our way in the 21st century. 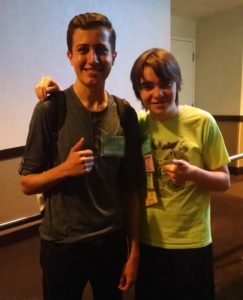 The boy meets on of his favorite YouTubers, DaikajuLegends. They are both from the Millennial generation. As the American Century winds down, the special bond we share with Japan thanks to kaiju is sure to remain. For one, the young generation has picked it up. There are many young fans, sustaining a cottage industry on YouTube of homegrown films in the genre. The platform is only a decade old, but for the young generation, it is as meaningful as any other medium. And Godzilla lives on, rebooted in the new MonsterVerse franchise. The monster suits have been replaced by CGI, but the spirit is the same. The next movie in the series will be out in the summer of 2019. I’m sure it will be all anyone is talking about at G-Fext XXVI. 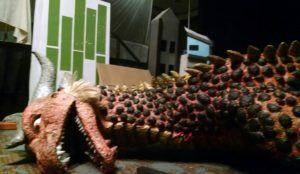 A monster suit of the G-Fest mascot, Gfantis, lies in front of some prop buildings in the Dojo Studios room. At work I bill all of my hours to “Project Octon,” but amusingly no one can tell me what the origins of this project are or how it got its name. I can only assume that it came on the heels of “Project Septon” and hope that it isn’t going to run out of funding any time soon. 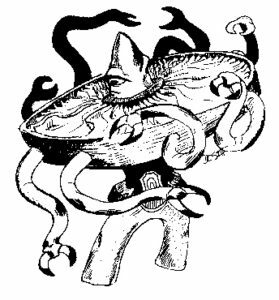 Now, in Dungeons & Dragons, the Octons are the sector governors of the Modron race from the outer plane of Mechanus, but what they might have to do with the company where I work I could not tell you. The whole mess reminds of me of the Jabberwocky Project from Better off Ted. If you haven’t watched that show, you probably should. I wonder if Project Octon was originally pitched like this? I’d better not let on that I don’t know what it means. What’s with all the ink? A conversation with my BFF started with me Stevesplaining (a thing I do) the social history of tattoos. You see, they were a Pacific islander custom (think Maui from Moana) which Europeans encountered in the Age of Discovery. This is why tattoos are associated with sailors. They then became a custom among Europeans of the lower orders, and were for a long time in the West associated with lack of respectability and the criminal underclass. Then, in the aftermath of the Sixties at the end of the twentieth century, young people sought to break free of cultural norms. Getting tattooed (and/or pierced) was a rebellious act of individualism practiced by a minority of youth. By the turn of the century it was a fad. And now, it has become a conventional rite of youth passage. Which is why you see almost every young adult with at least some tattoos. 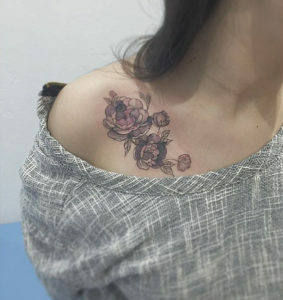 My BFF replied, “Have you even talked with anyone who has tattoos and asked them why they have them?” I had to admit that I really had not. “It’s because they feel like it’s the only way in which they can truly express themselves,” she continued. “You mean that their personal bodies is the only space over which they have any control?” I’m thinking how the young generation must feel powerless in a world politically and culturally dominated by their elders. So that’s two different perspectives on the frequently tattooed Millennial generation. What do you think?